It is necessary in the materialistic age in which we live, to become acquainted with holy personalities which our long-suffering Lord sends us, so that we can be assured that He has not abandoned us. One such personality is Papa Nicholas Planas, who lived in the beginning of our century. He was born in Naxos in 1851. His parents, captain John and Augustina, were quite well off but were also good people, with the simple and pure soul which distinguishes island people. They had their own estate, with a little chapel in the middle of it bearing the name of Saint Nicholas. Very frequently little Nicholas Planas would hide in the chapel wearing a bed sheet, and he would chant whatever he knew, as he was still a small child. At other times he would gather his friends, and they would "celebrate" the Divine Liturgy. He learned his first letters from his grandfather, Father George Melissourgos. Near him, Nicholas learned to read the Psalter. He observed his grandfather's every movement in the Holy Altar and followed him in all the liturgies he did in the innumerable country chapels. One winter night -- as Papa Nicholas himself related about his childhood life -- they were sitting near the fireplace and he told his father, "Father, at this moment our boat, the Evangelistria, is sinking outside Constantinople." Trembling, his father said to his wife, "Woman, what is the child saying?" And truly, at that moment their boat was sinking. Immediately, to dismiss the idea of holy foreknowledge which he had, he said, "All small children have foreknowledge." (And because he didn't have any teeth he spoke like a little child). His father died young. He had been pained in soul, not only for the loss of their boat, but even more so for the young lads who were lost along with it. Thus he left Nicholas an orphan at fourteen years of age. His mother took him and they went -- together with his sister -- to Athens. At that time Athens began at the Acropolis and reached up to Panagia Vlassarou Church. They settled somewhere between Saint John of Plaka and Saint Panteleimon of Ilissou because there were quite a few Naxiotes builders and workers there. Their days were difficult. His mother worked washing other homes so that they could survive. She took her children together with her no matter where she was working, because she was afraid of Athens. She trembled at the idea that they might take the evil path. When he reached seventeen years of age, his mother married him off to a good girl from Kythira, Eleni Provelegiou. They had one child. Afterwards he was ordained a deacon in the Church of the Transfiguration, Plaka, on July 28, 1879. 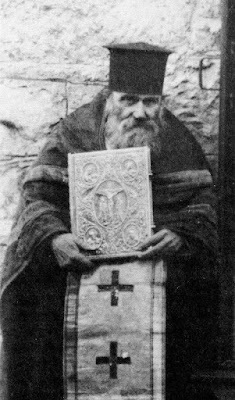 Five years later, on March 2, 1884, he was ordained a priest in the Church of the Holy Prophet Elisha. In the meantime, however, his wife reposed. And so, carrying the burden of being a widower, he entrusted himself and his son John to God's mercy. He had no estate because he had split it with his sister and had put his own portion as collateral on a loan, so that a compatriot of his could be saved from debt. He was compassionate, and had no care for worldly things or estates. Night and day he was absorbed in divine worship, and with his small parish of Saint Panteleimon in Neo Kosmo which was comprised of thirteen families. The people loved him. His simplicity, his island piety, his kindness, his chastity, his lack of love for money, drew everyone to divine worship. Everyone wanted him to bless their homes, their stores. And he ran everywhere joyously. From aristocratic homes down to the poorest homes, he never kept a drachma on him. The poor always waited outside the church for him to distribute whatever he had in his pocket. However, a certain priest without a parish of his own, in cooperation with the council members of Saint Panteleimon, kicked him out of his parish and sent him to the Church of Saint John the Hunter, in Vouliagmeni. The new parish was very poor and was comprised of eight families. His payment as a priest was one piece of meat from the fattened lamb of Meatfare Sunday or Christmas. This did not brother him, however, because fasting was most important in his life. So long as he had a church in which to liturgize, he was happy. "I'm crying, my child, because they kicked me out of Saint Panteleimon's." "Don't be said, Father. I am always with you." "Who are you, my child?" "I am Panteleimon, who lives in Neo Kosmo." Every year, on the feast of Saint Panteleimon, he would go to the Saint's church in Neo Kosmo and do a vigil. One year, as he himself related, he was sick and had a fever. His relative did not allow him to go for his customary vigil. But because of the love which Father Nicholas had for the Saint, he went anyway. "That night," he himself said, "after the Liti, exhausted, I leaned on the edge of the Holy Table. In the delirium of the fever I saw the Saint in front of me, young and vigorous, holding a small glass full of medicine, and he told me, 'Drink it, my Father, to become well.' I took it from the hand and drank it and became completely well. The fever left me. For a whole week I came out through the Royal Gate and said, 'My children, I was very sick tonight, and at this moment Saint Panteliemon gave me medicine and I drank and became well.' Everyone believed it and knelt down, glorifying the Saint." For fifty consecutive years he liturgized daily from 8.a.m. til 2.p.m., in snows, in revolutions, etc. Not even with the invasion of the Anglo-French in 1917 did he interrupt his series of Liturgies. 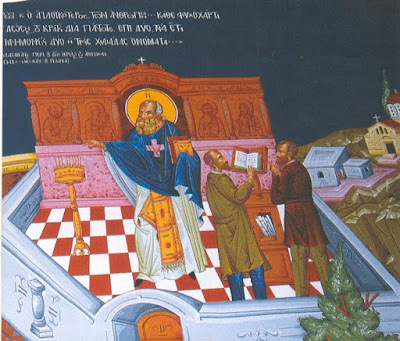 In the narrow streets of the Acropolis at 2:00 in the afternoon in July, he would liturgize in small chapels, as the sweat settled on the sacred vestments of this true laborer in Christ's vineyard. He ate every night. He fasted from oil every lenten period. As a confessor he was not strict about fasting, though when it concerned himself, he was very strict. One day someone gave him a little chocolate and told him it was fastworthy. He took it in his hand, looked at it closely and said, "Just to be sure, take it back!" And he would respond, "My bills and my contracts." "Aren't you tired, Father? When will you rest?" He would cross his hands and humbly respond, "I shall chant to my God as long as I live." When he would go into church, a stir would occur from the reception people would give him. Some would kiss his hands, others his cassock, others his little head since he was short. Most of the time he liturgized in the Church of the Prophet Elisha. On feast days he would he would go to his own parish. In the Church of Saint John there was a caretaker who disliked the elder. One day she swore at him with hand gestures, and at night she saw Saint John saying to her, "What did my servant do to you that you would swear at him like that?" And he gave her a slap on the cheek. In the morning her cheek was black and blue. 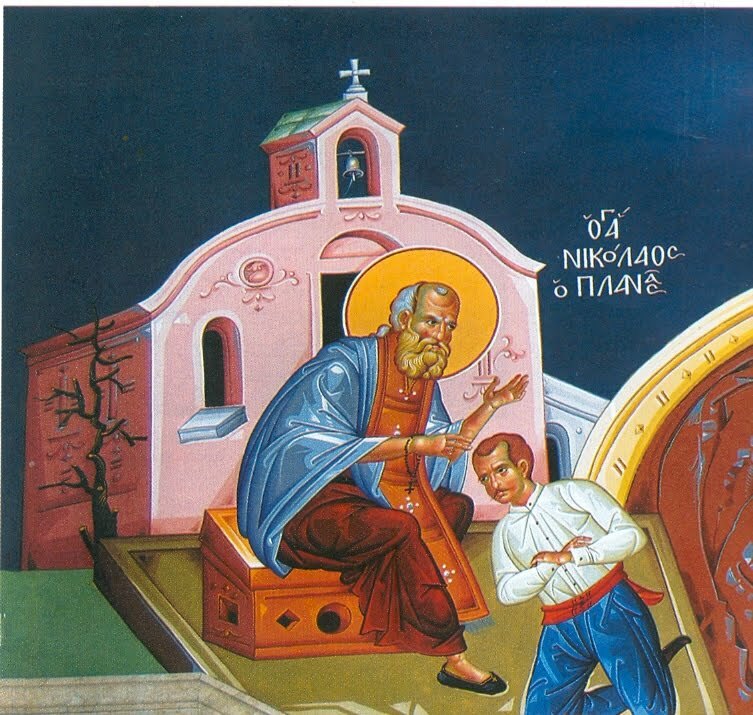 The next day when Father Nicholas went to church the caretaker went in front of him, fell at his feet, asked his forgiveness, and simultaneously asked him to step on her hands. The meek one went off to one side. She shouted, "Step on them, Father!" And again he responded, "But why should I step on them?" This lasted quite a while until he forgave her for what she had done, even though he had not noticed it. His patience and forbearance were unlimited. He had a helper, Michael, who always accompanied him and chanted if no one else was there. Even though he loved the elder a lot, at the same time he tormented him. On freezing days of winter when he was forced to be near Father Nicholas while he commemorated for unending hours, Michael would shout "Come o-o-on, Father-er-er-er! You are looking to take the dead out of hades and bury us with the cold." Another time, he did not allow him to do a supplication service to the Panagia at the end of the Liturgy. Father Nicholas was pout-faced all day and would say to himself, "Imagine Michael not allowing me to do a supplication service!" And he would repeat again, "Imagine, he wouldn't allow me." When sometimes they argued in church, the elder would hide in the altar so as not to take part. And once he was advising one of his spiritual children on how to restrain her anger, and would say, "Do you think, my child, that I don't know how to speak out? I know but I think of the result." The children who were in church would see him shining with heavenly light, doing unexplainable gestures, or remaining for a long time attentive, as if something were happening to him. These were the moments when he was communicating with the saints and being drenched with the light of Paradise. Many times they would see him not standing on the ground. A little eight year old child once came out white from the altar and told his mother "Mo-o-om, Father Nicholas is this high off the ground" and he showed her with his hand a half cubit above the ground. "Don't be afraid, my child, all priests are elevated off the ground that way when they liturgize," his mother responded, doing her cross to settle him down. The children would see him being elevated to the sky and not stepping upon the ground, because he scorned all earthly and material things. His mind was high up, on Him Who He worshiped, and he would not turn his eyes to look at what the people call material goods. HIS LACK OF LOVING MONEY. Once some for whom he had read a supplication service gave him a respectable sum of money in a sealed envelope. He gave it away immediately, still sealed, to a poor woman. The man who gave it to him got upset and said, "Why, that blessed one, wouldn't he even look at what I gave him?" He told a spiritual daughter of his that he had cut a payment to eleven families of widows and orphans, and furthermore, he said, the young widows especially have need, because poverty urges them to corruption. A lot of money would pass through his hands, but he would keep nothing. He would immediately give it away to charity. Many times he remained without even a penny for himself. Once he took a horse and carriage to take him somewhere, without noticing that he did not have any money. The carriage driver said to him, "Aren't you the parish priest of Saint John's, Father Nicholas?" "Yes, my child, I am." "Well, I don't want money, just your blessing!" Another time some people where discussing politics at a certain house. "So, what do you say, Father?" they asked him. Once he recovered from the depth of his thought, he wanted to say something. "Who is governing now?"! Imagine how little knowledge he had of secular matters. Once he set out on his own to go to chapel in Peristeri, but he lost his way. He advanced, distressed and praying, without knowing where he was going, until he saw a young lad in front of him, saying to him, "Did you lose your way, Father? I will guide you." The young lad went in front and Father Nicholas went behind, and they reached the door of the church. Here he, himself, relates what happened: "As soon as we reached outside the door, I turned to give him thanks, and immediately he shone brilliantly, and I lost him." When he liturgized, he wanted everything to contribute to the majesty of the Divine Liturgy. He chanted with such contrition that he would hear the angels chanting with him. Once, he asked a spiritual daughter of his whether she also heard the angels. "No, my Father, I don't hear them." Immediately he repented and said to himself, "I shouldn't have said it, I shouldn't have said it..."
For the duration of the half century in which he liturgized without a break, he never lacked prosphoron (holy bread used for the Divine Liturgy). Always some woman would bring it the night before or some nearby bakery would provide it for him. One day the Matins (Orthros) had proceeded quite a way and no prophoron could be seen anywhere. He sent helpers to go to the women he knew always had prosphoron; he looked in the cupboards of the sanctuary -- nothing. He was distressed to the point that he started to cry. After such a continuance of liturgies for a cessation to occur now! Whereupon they saw him coming out of the Royal Doors holding a prosphoron (the Seal only, not the whole loaf), which was still very warm and which he had found on the altar table. Moved with joy, he said, "My children, what a sign God did for me!" All miracles he called signs. He did not delve too deeply into these phenomena; he considered them natural, out of his great faith. And he did not comment very much about them, so as not to put it on himself. One night, the eve of the feast of the Holy Hieromartyr Phokas was dawning. One of his spiritual children saw a majestic priest behind Father Nicholas, who was observing how they were chanting the Divine Liturgy. When she mentioned this to the elder, he said to her, bringing his finger to his lips, "Shhh! 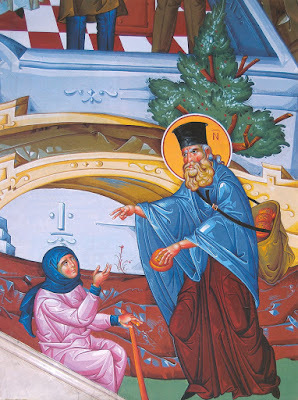 It is the Hieromartyr Phokas." Father Nicholas knew how to censure, to correct, to enlighten souls, without rhetorical sermons, but merely with his life, his presence. A rich woman got sick, and her cousin suggested that they bring Father Nicholas to read a prayer for health. The daughter of the sick woman liked external propriety. So she said, "Let's bring a more respectable looking priest from the bigger churches, and not him, who will be dusty from church," etc. That night she saw Father Nicholas in her sleep, with all gold vestments, saying to her, "Do I please you, my child?" Startled, she awoke and called father to read a prayer for health. When he came, the daughter of the sick woman ran piously, and she knelt down to kiss his hand, he said to her, "Did I please you as you saw me, my child?" Awe and astonishment rushed all through her body. Never did she expect such a rebuke for her vanity. Yet one other incident reveals the unsurpassed faith and piety which he had in the performance of his sacred duties. He went one day to commune a leper, but the illness had destroyed his lips so much that he could not take the Holy Body of the Lord, and it fell a little to the side of his mouth. Without hesitation, Father knelt and took the Divine Pearl which had fallen, and "consumed It"! Those who have a difficult time consuming because they fear germs should see this! What a blasphemy! The irrational thoughts of darkened unbelievers. In the various churches where he celebrated he was the consolation and refuge of people. He was the "sacred little elder" who comforted every human pain. His reputation had extended to the various eparchies also, and people hastened form everywhere to hear him liturgize, to kiss his hand, for him to bless them. He reached 84 years of age and had never been slandered once, nor did anyone say anything against him. Everyone knew him and respected his holy personality. When he passed by they greeted him, taking off their hats. On March 2, 1932, however, his holy life reached its end. He liturgized for the last time on the Sunday of the Prodigal Son. As soon as he consumed from the Holy Cup, he suffered a light fainting and was transported home, where his son John, and his daughter-in-law Marigoula, offered their last services to their holy father. Like a little bird he gave up his holy soul to Him Whom he had worshiped his whole life long. News of the grievous event spread to all of Athens. People ran to venerate the relic of the venerable elder. Everyone wanted to kiss his hand for the last time. The Archbishop of Athens, Chrysostomos Papadopoulos, suggested that the burial take place at night so that everyone could embrace him. Thus it happened. His body was buried in the courtyard of the Church of Saint John. His bones were placed in a silver reliquary in the new majestic church of Saint John. His whole life was proof of the divine power and wisdom which God the Creator grants to those who love Him and keep His commandments. For this reason the noted writers, Alexandros Papadiamantis and Alexandros Moraitidis, attached themselves to the disciples of the uneducated but wise priest (they would always chant near Father Nicholas at Prophet Elisha). 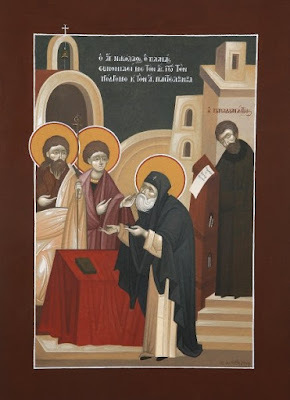 For this reason great spiritual names such as the Abbot of the Sacred Monastery of Longovarda in Paros, Archimandrite Philotheos Zervakos, praised him. 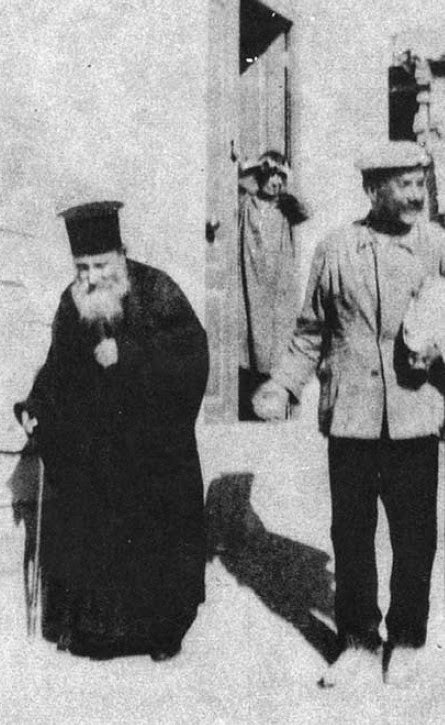 The Church of Greece, with an introduction from His Eminence Metropolitan of Patras, Nikodemos, who personally had met Saint Nicholas and was granted to get his blessing, asked the Ecumenical Patriarchate to recognize Father Nicholas Planas' holiness. With a special Synodical Deed, the Patriarchate numbered him in the listing of saints of the Orthodox Church, and appointed that his memory be celebrated on March 2nd. The Glorification of Father Nicholas Planas took place in 1992. Let us praise our protector, the godly Nicholas; as one endowed with blest virtue, he shone forth as a true priest of the Most High God, and was His fervent worshiper. For, by his holy life on earth, he hath left us most sublime, divine and unfailing teachings of long-suffering, meekness, patience, unfeigned humility and true God-like love. Humble of spirit and pure of heart, illustrious in life and dispassionate of truth, wast thou, O wise one. Thou didst illumine all by the virtues and dost grant grace unto them that draw nigh unto thee; and by thine intercessions, thou dost heal them that call upon thee, O Father Nicholas. 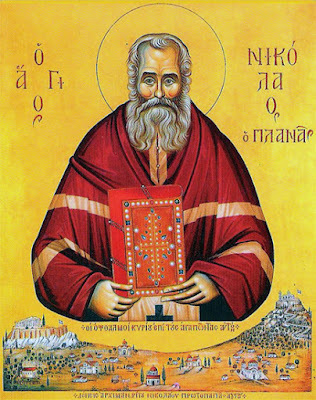 As a simple shepherd of Christ God's lambs, thou didst tend thy flock well on the pasture of piety, nourishing their spirits with ceaseless supplications and leading them to Christ, O wise Father Nicholas. From the article, "Papa-Nicholas Planas" in Orthodoxos Philotheos Martyria, Vol.64, Orthodoxos Kypseli Publications, January-March, 1996. Translated by Father Nicholas Palis.